Hawaiian Pools is proud to offer a wide selection of amazing fiberglass pool designs by Thursday Pools and Imagine Pools. In addition to their quality, fiberglass pools offer a variety of designs that fit your needs and style. Many traditional models are available as well as those with sun ledges, beach entry, and shallow & deep end benches. Fiberglass pools come in classic colors as well as some more exotic ones. Fiberglass pools are pre-fabricated one-piece composite based units. The pool shell is delivered to your home and is ready to be installed usually rendering it the quickest of installation times in comparison to shotcrete and vinyl liner pools. Customize your fiberglass pool with water features, a spa, lighting, and wet decks. Imagine the Possibilities with your favorite fiberglass pool model, and Hawaiian Pools with install it with pride! Hawaiian Pools will meet with you on-site to review the details of your pool project. 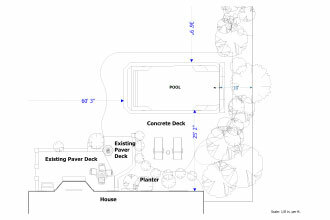 We will physically lay out the design to set the exact location of the pool, along with pool grade elevation. 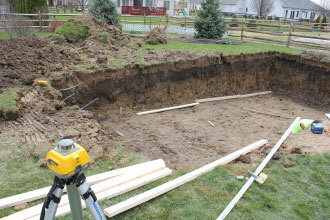 An excavator is used to dig the hole to the manufacturer’s specifications to the size and depth of the pool. Crushed stone is then placed and leveled at the bottom of the excavation to provide a solid, even base for the pool to sit on. 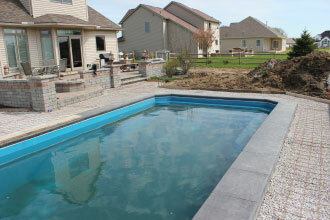 The pool shell is delivered to the home where it is fully inspected and then accepted. 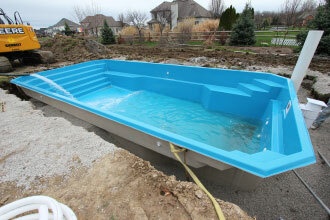 The pool shell is transported to the backyard and is then methodically placed into the carefully prepared hole. Once the pool is in position and is deemed level, backfill immediately begins and water is added to the pool to keep it in place. 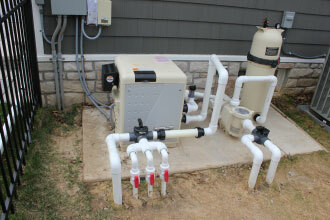 PVC plumbing lines are then run from the pool suction and return fittings back to the pool equipment pad. The pool system components are placed on the pad and hooked up to the plumbing lines to provide circulation, filtration, sanitization and heat for the pool water. A colored concrete cap with a Roman Slate stamped texture is poured to help secure the pool shell and to beautify the pool’s edge. This gives the pool a custom, elegant look. Getting closer to completion, it is now time for the surrounding decking for the pool. Whether it is a style of concrete, paver stones or a combination of these, the sub-base is leveled and compacted with crushed stone to provide a solid base. 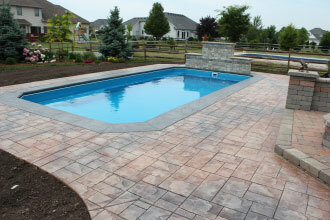 The chosen material is then installed to create your pool’s surrounding decking. *This is a basic summary of a very skilled process performed by our crew of APSP Certified Pool Building Professionals and experienced laborers and by no means is all encompassing. The chronology and stages of the process may vary depending on the complexity of the project and other factors, such as weather and availability of materials.